Description Special Design 'Free Spinnng' Ground Spike. Dual Spike design adds extra stability to your Teardrop Flag when used on grass. 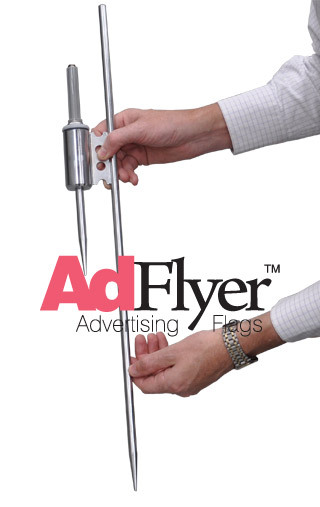 The spike attachment is designed to allow the Teardrop or Feather Flag to spin in the wind. The Ground spike comes in a twin spike design allowing for greater stability in grass and dirt areas. Attached spinner allows the Teardrop and Feather flags to spin/rotate in the wind. Removable Twin spike attachment means the you can bolt the spinner part to a fence or fascia.